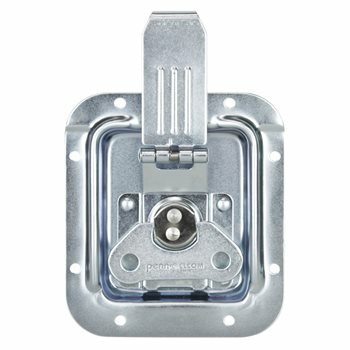 Securely close your case with a Penn Elcom valance spanning latch mounted in a one-part dish. This latch has a blade action which allows it to be mounted below the edge extrusion, eliminating the need to cut through the extrusion. When unlocked, the blade springs back onto the dish. The catch plate can be mounted directly onto the lids edge extrusion or onto a Lidmaker extrusion. The Zinc plating offers an excellent protection against corrosion. The protective ridges shield the latch from being accidentally hit or damaged. The top of the dish is offset so it can sit on top of the edge extrusion.